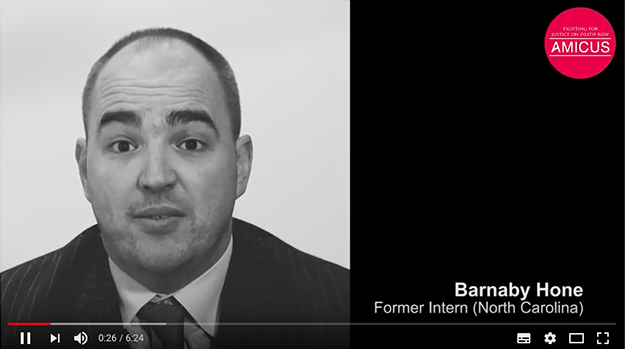 In the following video, Drystone Chambers’ Barnaby Hone joins trustee Mark George QC, patron Sir Mark Rylance, other former interns and representatives from Amicus in appearing in a short video clip promoting and explaining the important work Amicus undertake. Amicus, founded in 1992, is a small charity that helps provide representation for those facing the death penalty in the United States where the death penalty is legal in 31 states, and in military and federal courts. Since 1973, more than 150 people have been released from death row with evidence of their innocence. Between 1976 and 2002, 44 people with intellectual disability were executed: the following video contains messages from former inmates who benefited from the charity and also a message from founder Jane Officer, who explains how the charity came to be formed following her involvement with the case of a death row inmate Andrew Lee Jones. Barnaby Hone assisted Amicus as an investigator, researcher, and legal assistant In the Capital Defender’s office of North Carolina, working on fourteen death penalty murder trials, and one death row appeal. The issues involved in these cases included; various types of mental incapacity, DNA evidence, ballistics, jury selections, racial prejudices, and prosecutorial abuses. Barnaby continues to be involved in death row work in America and throughout the world. Barnaby is primarily a fraud, international asset recovery and financial crime specialist – see here for more information on his background and expertise. Watch the following video to find out more about how Amicus helps provide legal representation to those on death row and how you might be able to assist their crucial work in this area.